Eggs, cereal, fruit or yoghurt? Plenty of people wonder what breakfast to eat before hitting the gym, and it can depend on what workout you’re doing. Get your breakfast choice right and it can help wake you up, boost your intake of nutrients and enhance your workout performance. 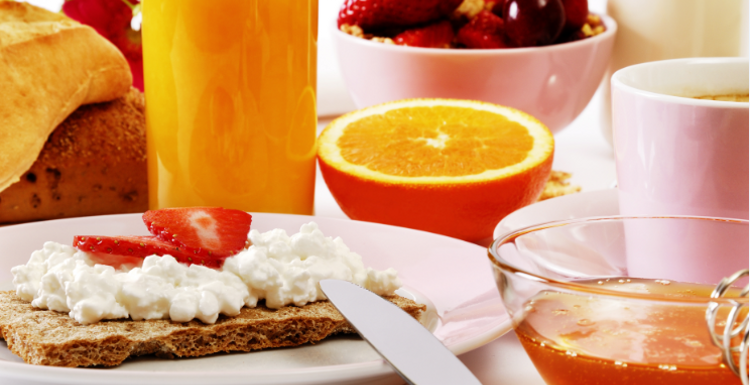 Match your breakfast to suit your type of workout and you will experience optimal benefits. Drink some coffee. Your morning caffeine fix does more than wake you up in the short term – its peak stimulatory effects occur between 30 and 70 minutes. So drink your coffee about one 45 minutes before you hit the weights to get the peak of the caffeine buzz. It’s best taken alongside foods which also provide energy, so here’s what to eat alongside. Choose avocado and egg on toast. Choosing wholewheat or rye bread over white will help you reap all that slow-released energy throughout your workout. Avocado is one of nature’s most nutritious foods and will help fuel and nourish your body, while adding an egg will give you 6g of protein that your muscles will thank you for. Choose simple carbs. If you’re doing a short, intense workout, such as HIIT class, Crossfit session or going for a sprint your muscles need carbs in the form of stored glycogen. In fact, recent research suggests that during short, heavy exercise it may be the only source of fuel your muscles are able to use. If there’s only an hour or so between breakfast and your gym session take in some simple sugars such as orange juice and white bread toast and honey to provide you with the instant energy you need. Eat oats for cardio. Oats gradually release sugar into the bloodstream so keep your energy topped up during the workout, unlike sugary cereals which make you crash after 5 minutes. You can easily customize them – prepare soaked oats the evening before if you’re short on time, or power up your porridge with berries for energy and nuts for protein. normally i take minimum 3 cup instant coffee and this is the pain killer for me. Great, I already have avocado and eggs on toast. I would also recommend smoothies with oats and bananas before you do a cardio session. I'd never thought about the fact that HIIT needs quick release energy. What a great excuse to enjoy some jam on toast! long-lasting complex carbs - nothing like them and good to see them recommended rather than the usual bad press. Egg on toast - carbs, protein, sorted. it doesn't matter what I'm doing - oats are always the one for me. I either have them in a smoothie, or straight porridge. Never let me down, simple and cheap. i had a strong coffee this morning before I did some lifting and whether it was psychological or not, I could lift more than usual!